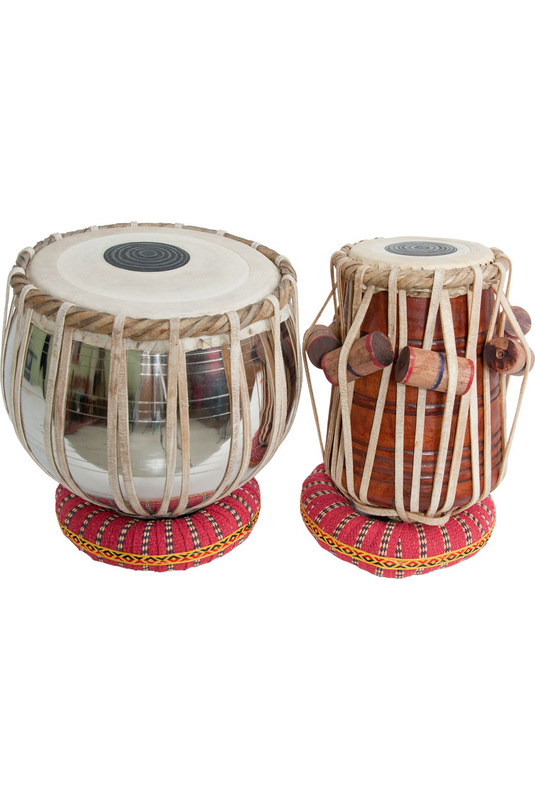 This tabla set has a 5.25 inch solid wood dayan paired with a stainless steel bayan. Both drums have traditional strap tuned heads. The stainless steel bayan has an attractive finish that is not prone to tarnish. The greater weight of the stainless steel adds to greater stability of the bayan during vigorous play, and creates a fuller richer sound than a non-pro light-weight bayan. The stainless steel is a large step up from an aluminum bayan found in student sets. Includes: the standard soft case, cushions, covers, and tuning hammer. Dayans may be sheesham or a similar hardwood. The turnings carved into the dayan are done by hand and will be unique. Cushion colors and patterns may vary. Dayan head diameter 5.25 inches. Average Dayan height 10 inches. Bayan head diameter 9.25 inches. Average Bayan height 11 inches.